We are not able to offer returns in store for items purchased online. However, if you would like to exchange the item in person, please go to 112 E 11th St. between 9-5 Mon-Fri, 10-5 on Saturday, or 12-5 on Sunday. As we are unable to offer store credit, the exchange must be of equal or higher value than the item being exchanged. Disclaimer: *All orders placed from December 3rd through December 9th will receive 20% off, excluding tax and shipping & handling charges. Offer only valid online. Offer runs from 12/3/18 through 12/9/18. See savings at checkout. Orders shipping to addresses in Texas are subject to sales tax of 8.25% on the order total after shipping & handling charges are applied. Cannot be combined with other offers or discounts. Not valid on prior purchases, or on State Agency Purchase Orders. 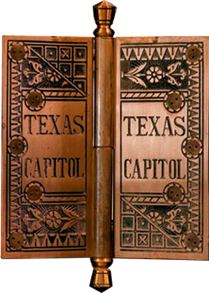 The State of Texas Service Awards began in 1998 as a partnership between the Capitol Gift Shops and the Texas Workforce Commission as a way to honor their employees for their many years of service. Over the years the program has grown to include a number of other state agencies. The service awards program aims to provide state agencies with a simple way to reward their employees for their dedication. The program offers awards for every 5 years of service, and the price of the awards increases relative to the years of service. The pricing tiers may be set by the agency and only one award may be claimed per recipient. The recipient has 30 days from the issuing of their login information to claim their award, reminder emails are sent out one week prior to the expiration of the event. For more information please email us at [email protected].